Bring your lips back to life and make them soft and supple. 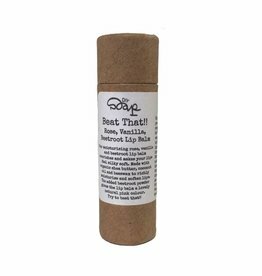 The lip scrub is enriched with almond oil for long-term care, the sugar scrub melts on your lips and softens and nourishes and the cinnamon gives your lips a boost and brings them back to life. How to use? Apply the scrub to the lips and use circular motion to exfoliate your lips firmly but not roughly. Use a damp wash cloth to wash off. Use the lip scrub daily for luscious soft lips. Contents: 30ml. Comes in a small glass jar. Brown sugar, Sweet Almond oil (Prunus Amygdalus Dulcis oil), vanilla oil (vanilla plantifolia), orange oil (citrus sinensis), Clove (Eugenia caryophyllus Leaf Oil), Cinnamon leaf (Cinnamomum zeylanicum Leaf Oil), Cassia cinnamon (Cinnamomum cassia leaf oil). At DIY Soap we don't do dry lips! Try our 100% natural lip balm in mint or vanilla. Go for wonderfully soft lips with this 100% natural lip balm with rose & vanilla. Naturally coloured with beetroot.